This 14-story apartment house has one of the most desirable locations in the world as it is directly across from Central Park on Fifth Avenue and The Frick Collection on 70th Street. The Frick Collection is the most magnificent small museum in the United States and has a very large garden on Fifth Avenue as well as another large one to the east on the sidestreet where it demolished the very fine townhouse of another famous at collecting family, the Wideners, that had been part of a very distinguished row of mansions, several of which are now occupied, at least in part, by very major art galleries such as Berry-Hill, Knoedler and Hirschl & Adler. 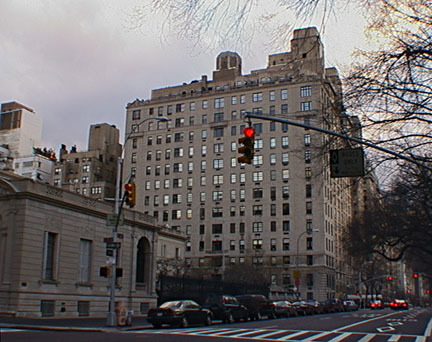 East 70th Street is also noted for many other fine mansions and institutions between Madison and Lexington Avenues. This 16-unit cooperative building is relatively modest by Fifth Avenue standards, but because of its small number of units and open views because the Frick is a low-rise "palace," it is a very desirable address. The site had formerly been occupied by a very impressive mansion owned by C. Ledyard Blair that marvelously complimented the Frick, which was Henry Clay Frick's residence when it was built in 1917 and was converted to a museum in 1935. "The replacement in 1927-28 by the developer Anthony Campagna of the C. Ledyard Blair mansion, only nine years after it had been built, with apartments designed by Rosario Candela (who ultimately was to design nineteen apartment houses on Fifth Avenue) and the firm of Walker & Gillette was the most dramatic signal that an era had abruptly ended," observed Robert A. M. Stern, Gregory Gilmartin and Thomas Mellins in their great book, "New York 1930, Architecture and Urbanism Between The Two World Wars," (Rizzoli International, 1987). "The Blair house had been designed by Carrère & Hastings as a southern wall to the garden they had created for their Frick Mansion across the street. While the new apartment building, known as 2 East Seventieth Street, permanently robbed the Frick garden of southern light, the architects nonetheless sensitively restarted the Blair House parti at a much greater height. The apartment was further distinguished by its combination of simplex and duplex units," the authors continued. "Builder Campagna bought the site for a record price on upper Fifth Avenue of $170 per square foot. The new apartment building was constructed with the westerly two-thirds of each floor laid out as a large eight-room simplex unit with the living room spanning the Fifth Avenue frontage. At the east end of the building there were 14 extra servants' rooms on the second and third floors, a duplex on the fourth and fifth floors, and three stacked triplexes above." The transformation of Fifth Avenue's "Millionaire's Row" of mansions facing Central Park into apartment houses occurred rather quickly. The city's Zoning Resolution of 1916, the first in the nation, permitted buildings to rise up to 150 feet in this area on the avenue. The great mansions were erected mostly between the 1890's and the start of World War I. In 1920, several leading civic organizations such as the Fifth Avenue Association, the City Club and the Real Estate Board of New York launched a campaign to change the zoning for this strip to reduce permissible building heights to only 75 feet as they were concerned that the 150-foot height would lead to real estate speculation in this area and dramatic change of what was considered to be one of the most impressive glories of the city. In 1921, the city enacted the desired amendment, but within a few years it was successfully challenged and overturned in court by a group of real estate owners and developers including Vincent Astor and architect J. E. R. Carpenter. Clearly, the subsequent redevelopment permitted many more people to enjoy direct, unobstructed views of Central Park from apartments in the tall buildings that soon were built. Just as clearly, however, the city would have been better served if the tall luxury buildings had not been built on Fifth Avenue, but on Madison Avenue instead, but the city was decades away from creating a landmarks preservation law and commission. The building has a doorman and a concierge and an attractive entrance and lobby, but no sundeck, no health club, no balconies and no garage.